One of the most important applications of electrolytic cells is the process of electroplating, in which a thin layer of a metal is deposited on an electrically conducting surface. Electroplating has many commercial applications including decorative and protective coatings. The purpose of this project is to get familiar with electroplating process and learn how it works, however you can expand your study and also determine the amount of electricity used to plate a certain mass of copper. You may also calculate the atomic mass of copper. 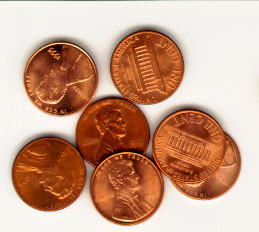 In this project you will perform copper plating on US pennies or any other metal. Can you also use US pennies as an anode for copper plating? Perform varieties of experiments and report the results.